The carrier Dwight D. Eisenhower is enjoying a noteworthy and productive post-availability period at sea. On July 2, Ike, operating off the Atlantic coast, was the scene of the first fully hands-free carrier landing as an F/A-18D modified to emulate the in-development X-47B Unmanned Combat Air System aircraft touched down under control of an onboard computer network linked to the plane. The aircraft was manned in case something went wrong, but the pilot kept his hands off the controls, the Navy told my colleague Joshua Stewart. See his story in the July 18 Navy Times. Four days later, the carrier and Air Wing 7 completed flight deck certification, just a week after taking the flattop’s first arrested landing since its 2010 deployment to the Arabian Sea in support of the war in Afghanistan — only three weeks after Ike left Norfolk Naval Shipyard in Portsmouth, Va., after completing a nine-month planned incremental availability. On July 7 in Washington, D.C., the carrier was given the Secretary of the Navy’s Safety Excellence Award for large deck combatants. Meanwhile, the carrier — enjoying a no-fly day Thursday, according to AIRLANT — continues operations in the Atlantic, qualifying new fliers from Fleet Replacement Squadron fliers. 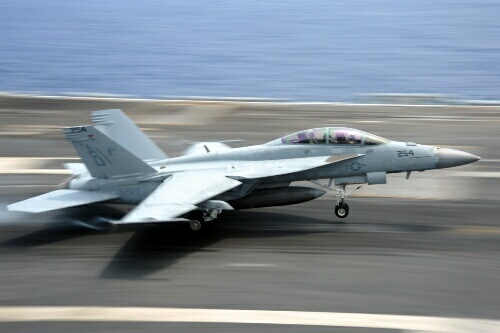 An F/A-18F Super Hornet assigned to the “Gladiators” of Strike Fighter Squadron 106 performs an arrested landing July 13 aboard the aircraft carrier Dwight D. Eisenhower. // U.S. Navy Photo by Mass Communication Specialist 3rd Class Nathan Parde.